Howard Zinn first heard the crackling truths of Woody Guthrie’s “Ludlow Massacre” on the eve of a cultural revolution. Sprouting from a working-class Brooklyn villa, he latched onto the emerging ethos of anti-Nixonism in the ’60s. After earning a pulpit of his own, he loudly called the American war machine to task. 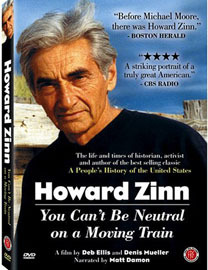 You Can’t Be Neutral on a Moving Train is an end-of-the-road homage to Zinn the historian, professor and activist, a man most likely to be remembered for his book, A People's History of the United States, and least likely for his arson charges while tenuring at Boston University. Narrated by Matt Damon (who once, as Will Hunting, pointedly namedropped Zinn), the film serves primarily as a time capsule for a towering, albeit aged, leader of the New Left. It occasionally bends from biopic to polemic, but not distractingly so. The clout of Zinn’s worldwide impact still remains intact, begging us moderns to ground our future in the fugitive compassion of the past, rather than the unyielding and cyclical centuries of warfare.